Michael Dunlop has claimed pole position in the Superbike class at the MCE Ulster Grand Prix. Michael Dunlop underlined his status as the red-hot favourite for Superbike glory at the MCE Ulster Grand Prix with a storming 131.783mph lap to seal pole for Saturday’s blue riband races. Long delays on Thursday due to heavy mist forced the organisers to shelve plans to run a Superpole qualifying session for the Superbike riders. With roads rapidly drying out, Dunlop began to up the tempo at Dundrod after Tyco BMW’s Ian Hutchinson had set the early pace with a 130mph lap to lead from GBmoto Kawasaki’s Peter Hickman and Bruce Anstey on the Padgetts Honda RCV. Ballymoney man Dunlop, though, made a stop to change to slick tyres from intermediates and shortly afterwards powered to the summit with a lap of 130.188mph, knocking fierce rival Hutchinson back to second place. As the pace intensified, Hickman – last year’s Superbike race two winner – showed his hand with a speed of 131.06mph to take over by 1.3 seconds from Dunlop. However, as the clock ticked down during the 40-minute session, Dunlop timed his pole lap to perfection, lapping the 7.4-mile course at 131.783mph to take the top spot on the front row by 1.1 seconds from Hickman. 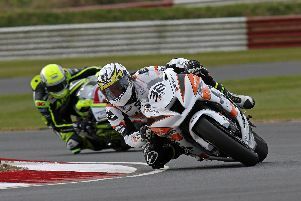 The 27-year-old had earlier seized pole in the Superstock class on his MD Racing BMW. Anstey finished a close third after improving his speed to 130.220mph, with Hutchinson, Dean Harrison on the Silicone Engineering Kawasaki and Honda Racing’s Conor Cummins the top six. Derek Sheils finished a solid seventh on the Cookstown B.E. Racing Suzuki ahead of Gary Johnson (East Coast/Burdens BMW), with William Dunlop on the MMB Yamaha and Dan Kneen (Mar-Train Yamaha) completing the first ten.